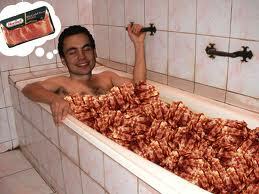 Can I soak in a bathtub of bacon salt? Don’t pretend like soaking in a bathtub of bacon isn’t one of your life dreams. I mean, bacon gives you the salt for soaking/scrubbing, bacon grease for moisture, and a crunchy snack, all in one! Relax with a book – uneaten strips make great bookmarks. Sounds pretty spa-tastic to me. I did what anyone would do. I posed the “soak in bathtub of bacon salt” question to the great and powerful Mr. Googles. Unfortunately, Mr. Googles did not return many results. And nothing on the health benefits of bacon bath salt soaks. I’m sure he’s just unaware. Love it! Rolling around laughing over here! If you bathe in bacon, every dog in the neighborhood will be your best friend.